Late autumn leaves, fog and a Great Blue Heron make for a scene reminiscent of a Japanese garden. An interesting aspect about photographing in fog is that sometimes you capture things you never saw through the lens. In the middle of this image, between the trees and just above a small mound of dirt and bush, stands a Great Blue Heron that I never saw until I actually printed this image. The color of the light, tinted blue by the open sky and fog, is very close in tone to the heron itself, effectively camouflaging the bird as it stands out in the open. While this image was not taken in a real Japanese Garden (there’s one not too far from where this was taken, however, in Maymont Park), this scene on the James one foggy morning in November puts me in mind of one. Taken with a Nikon D600 and the 3rd generation Nikkor 80-400mm zoom lens at 250mm. 1/250th @ f/6.3, ISO 400. 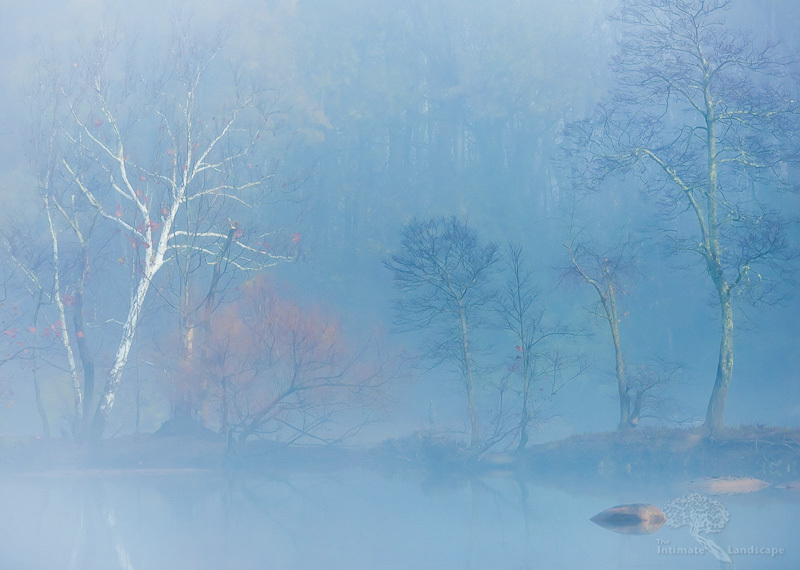 This entry was posted in Landscape Photography and tagged fog, Great Blue Heron, James River, Trees.